Rebecca and David Timms, with Lily, onsite. Photo: Bay of Plenty Ballance Farm Environment Awards. It’s been a journey of hard work, thinking outside the square and tenacity to get D&B Hort Ltd – growing plants for the future of the kiwifruit industry – off the ground at Paengaroa. 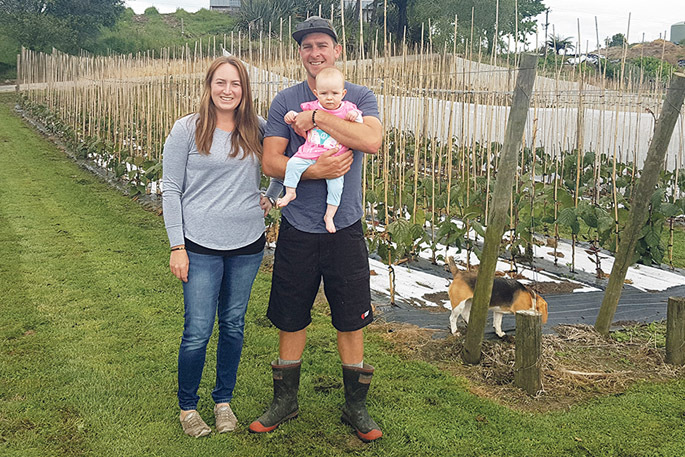 Now owners David and Rebecca Timms are Bay of Plenty Ballance Farm Environment Awards’ finalists for 2019. Seven years ago David, who’d been working on dairy farms since leaving school, entered the kiwifruit industry. He was managing the Dyers family’s 14.43ha Gold Nugget Orchard at Pukehina when vine-killing disease Psa-V hit in 2010. So one of David’s first jobs on Gold Nugget was to take a chainsaw to kiwifruit trunks, cutting out Hort16A vines. “I started kiwifruit when Psa broke out – obviously, things weren’t looking the greatest but I look at it now and feel I was lucky to be part of a significant change in plants for the industry,” says Dave, who still manages Gold Nugget full-time. That first season Gavin leant Dave gear, space at his orchard to grow the seedlings, and gave him pointers “coaching me along”. “From there we’ve gone in our stride,” says David, whose wife Rebecca gave up her veterinary career to work full-time in the nursery, and raise the couple’s first child Lily. But they needed more land. The Timms bought a house at Paengaroa and in September 2016 purchased 22ha next door, with the Dyers being loan guarantors for 18 months. “This was very admirable on their part; it was big help for a younger couple,” says David. David says Wayne recycles pots “which many other guys don’t” so all return to him for cleaning and re-use. Each plant has a bamboo stake they are trained to climb up. “That’s where a lot of time comes in – because what growers want is a straight single graft-able stem,” says Rebecca. Secondary shoots are broken off, and weedmat is placed between mounds to curb weed growth. “We’ve probably eliminated more than 80 per cent of our glyphosate use since introducing weedmat,” says David. The measure also reduces labour needed to remove weeds – “time spent hand-weeding is better spent training plants – and with young seedlings we don’t want to risk spraying around them”. The young couple say they entered the BFEA awards after Dave was involved last year with Gold Nugget’s entry. “We’re at the end of a five-year plan, and about to roll into another so gaining that outside critique from the judges will be beneficial for us.